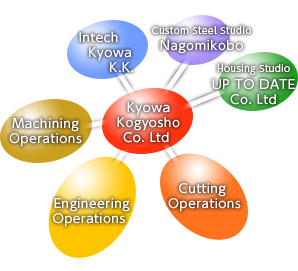 Kyowakogyosho provides a wide range of customer services including sale of materials (mechanically and flame cut), machining, engineering (design, manufacture, assembly), plant maintenance, and equipment installation. Kyowakogyosho Co. Ltd, the core of the Kyowa Group, was established for repair and modification of machinery in the automobile industry and maintenance of associated factory plant. It has subsequently expanded into rationalization, labor-saving, and manufacture and installation of automated machinery, and is currently involved in allocation of specialist SF for design, machining, materials processing and sale, and a range of operations in the construction field. Working closely with Intech Kyowa, another member of the Group, in areas such as piping installation, we have developed an integrated production system covering all facets from design to manufacture, assembly, and installation. We have also established our own internal research and development section associated with Group products. The entire Kyowa Group has as its mission the provision of products to satisfy the needs of our customers within an ever-changing world. Copyright©1996-2015 Kyowakogyosho Co. Ltd All rights reserved.